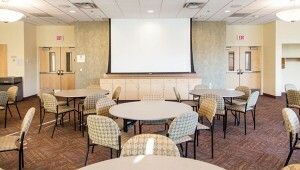 The Anna Heilmaier Meeting Room is perfect for a meetings and special events with floor to ceiling panoramic windows overlooking The Wellstone Center’s neighborhood—look to the old West Side on one side and built up downtown St. Paul on the opposite side. 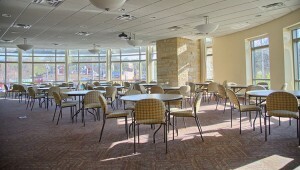 You can draw the curtains for a cozy atmosphere during presentations and let the light in during social hour, for two different feelings in one great space. Furnished with four-foot round tables and comfortable padded chairs, the stone walls and white columns create an ambiance of elegance and sophistication on the second floor. Wireless microphone and sound system plus a motorized projection screen complete the package for a perfect event.